I am always happy to try out new things. 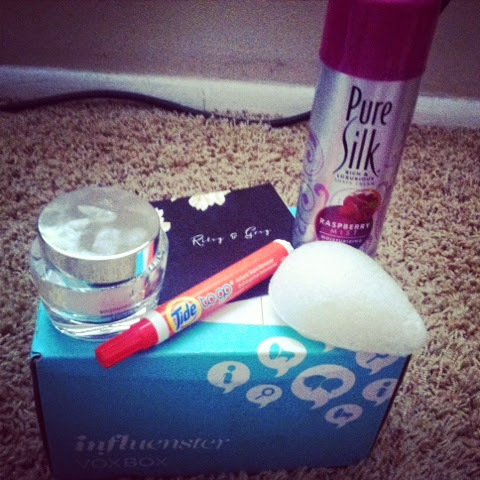 Influenster sent me this wonderful Vow Vox Box for those that have a soon coming wedding. The Pure Silk Shave Cream is wonderfully scented. My version was Raspberry Mist. It was not overwhelming but pleasant. It is smooth and it did not give me razor burn or leave my legs dried out. The Sally Hansen Complete Spa Manicure blue polish was great. It did take much longer to dry and I had to redo a couple nails thinking the were ready. Once they do finally dry they do seem to be holding up well compared to other brands. The Tide To Go Pen is something new for me to try. It does seem to work a bit when you get it on a fresh spill but if it dries any on your clothing it does not work at all. The pen is not very moist so I think that it uses the spills moisture to help activate it. Riley & Grey is a place that you can make a website for your wedding. It is nice professional looking and easy to use. Everything is right at your fingertips to create your own great site to publish your wedding on. EcoTools Pure Complexion Facial Sponge is a hard little sponge until you get it wet. It does soften up some and makes a great sponge to get ride of build up from makeup or oil. I really enjoyed this the best. It made my fresh feel fresh with out having to use any type of chemical. Be sure to check some of these out for yourself. You provide valuable reviews on all these products and services. I just wanted make an addition to your post. Similar to Riley&Grey, this event planning software lets you work together with everybody involved in your wedding planning process. It's drag and drop style seating planner makes guest management fun again! It's completely free for planners. Let me know what do you think about it? Keep it up with all these valuable reviews. I'll try the Tide To Go Pen, I didn't even know such thing existed!